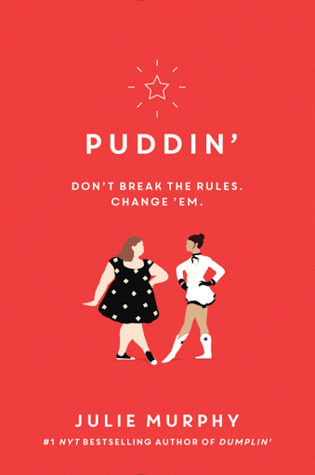 If you've read Dumplin' or watched the excellent movie version you'll remember Millie Michalchuk, inspired by her friend Willowdean to enter the Miss Teen Blue Bonnet Pageant and surprising many by winning second place. Millie has gone to fat camp every summer, but this year she is determined instead to follow her dreams by attending broadcast journalism camp at the University of Texas. She is also determined to turn her friendship with Malik into a romance. Meanwhile, dance team member Callie Reyes is hoping to compete at nationals and finally become team captain. But when a vindictive prank goes wrong, she finds herself in a lot of trouble and she loses everything she thought was important in her life. The story alternates between these two characters who form an unlikely friendship. I loved Millie. She is into crafting and inspirational quotes and organizing. I'm sure she has a killer bullet journal. She is learning to speak up for herself and it's heartwarming and satisfying to see her flourish. Which is not to say that anything comes easy, but that I know she's up for the challenge. Millie's mother is very strict and determined that Millie will attend Daisy Ranch again this summer and this will finally be the year she loses the weight. Never mind that she's been torturing herself with diets for years without any noticeable change. Millie is just done with all that - with this goal that feels meaningless, the constant diet cycle, with feeling like she's not good enough because she's fat. She has more important things to do. Oh, and I loved her flirty relationship with Malik, an awkward boy who is super-friendly with Millie when they chat online every evening, sometimes all evening, but kind of stiff and stand-offish when they see each other at school. Callie was complicated and abrasive. She was very hard to like, partly because she was so honest all the time and didn't try to soften her words. When her world falls apart because of some bad choices, she is thrown together with Millie and begins, very reluctantly, hanging around with her group of friends. They are no more excited to spend time with Callie than she is to spend time with them, but it's Millie who decides they will embrace Callie and that, despite her flaws and her former popular-mean-girl status, she is deserving of friendship. Callie has little to lose at this point and because she's grounded for potentially the rest of her life she takes what few social opportunities she is allowed to engage in. Even though she had been part of the super popular group at school, Callie had often felt like a misfit, just as Millie and her friends had. Sure she fit in at school, but at home she often felt like she didn't belong. Her father is Mexican, but her mother, stepfather, and little sister were all white and blond. Callie was a great, complicated, complimentary character to Millie and I loved seeing how their friendship developed. They also both had romantic interests and gave each other advice on getting these relationships off the ground. But the friendship was the most important part of this story, and how these girls supported each other as they tried to achieve their goals and just figure out who they are. These days I am too often reminded that no matter how much I like to be inside the teen characters in books, in reality I'm more like their parents. Honestly, I'm older than some of their parents. At one point in this story Callie refers to her mother's "old lady music" which turns out to be Tori Amos!! Wow, I really felt that in my old lady heart. But mostly I just got really into the story and rooted for these imperfect humans trying to find their way in the world. The audiobook was excellently narrated by Erin Mallon and Kyla Garcia, two distinct voices that brought the characters to life. I had such fun listening to this book that I didn't restrict it to my commute. I would find things around the house to do while listening, and I credit it for helping me get my new knitting project started. (Millie would approve.) In short, don't miss out on this book! It's the perfect pick-me-up to lift your spirits as we emerge from the bleak winter months and look forward to better times to come.